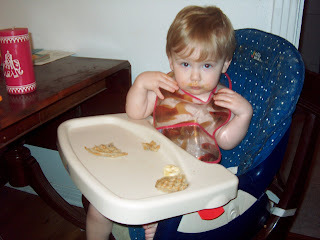 Here's the thing about bibs: You get ONE use out of it, and then it's gross and must be washed. Being the "path of least resistance" type that I am, I usually don't use bibs. I figure the outfit will need to be washed anyway, so why bother? Well, I have found the answer to those stained clothes that my lazy method has caused...Giggles Bibs! Giggles Bibs are hip and cool (not to mention Fun...Funky...and Unique! ), but best of all, they're vinyl! So, after each use, all you've gotta do is put that sucker under some hot water and it's good to go for the next meal! The bib you see on little N$ is the Goldfish bib and the one on Miss Hailey is the Do Dots Red bib. There are 17 other options to choose from, including Glitter, Dots and Confetti! If you've got my Type B personality, then a Giggles Bib is a MUST HAVE!